Spinnaker offers plenty of comfort and fun for your family vacation. The first floor has a queen bedroom with a private screened-in porch, a trundle bedroom with a bath (shower only) and also adjoins to the enclosed outdoor shower. The second floor includes the living room, a dining area, kitchen and bath (shower only). 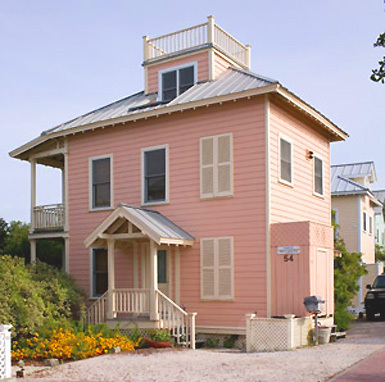 There is a third floor loft with a twin bed, and a great view of the sparkling emerald-green waters of the Gulf and the town’s best kept secret, Rosewalk, a cluster of quaint cottages with a pedestrian footpath meandering through a thick grove of oaks trees. For more pictures of Spinnaker, click here.